First we’d like to thank everyone who entered into last weeks Christmas In July challenge, we had a record number of 51 entries! A big thank you to everyone who played along! We have a prize winner today for the goodies from the Christmas In July challenge, our lucky winner is Barb Housner! Congratulations, I'll be in touch with you soon Barb! This week’s challenge is to simply use patterned papers on your cards. You can make cards for any occasion you wish just use some of that pretty patterned paper that’s in your stash! We can’t wait to see your cards for this weeks challenge! Our beautiful sample this week was made Colleen Holmes! 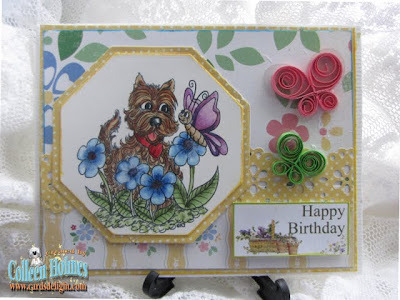 To see more of her wonderful creations you can visit her blog A Card’s Delight. Thank you Colleen for your fabulous creation! What an adorable card... love doggie cards and that stamp is adorable. Guess I'm going to have to dig out my quilling supplies now, you set the bar high. Colleen -- Your card is fabulous as always and I loved your wonderful blog post! You are such a dear and sweet friend and I'm so lucky to know you!! Great job Colleen! Good to see you here! Thank you and when I visited your blogs I saw super created cards that were bright and cheerful! Awesome job and TY once again. thanks for choosing me for last week's winner. What a gorgeous card! And thanks for a fun challenge, Ladies! thanks for the fun mid-week challenge, and Colleen, thanks for sharing your beautiful sample card! I just love those quilled flowers! ummmm.......make that quilled butterflies! Sorry! thanks for the opportunity to play at your challenges!